or you can live with chronic illness and be angry. 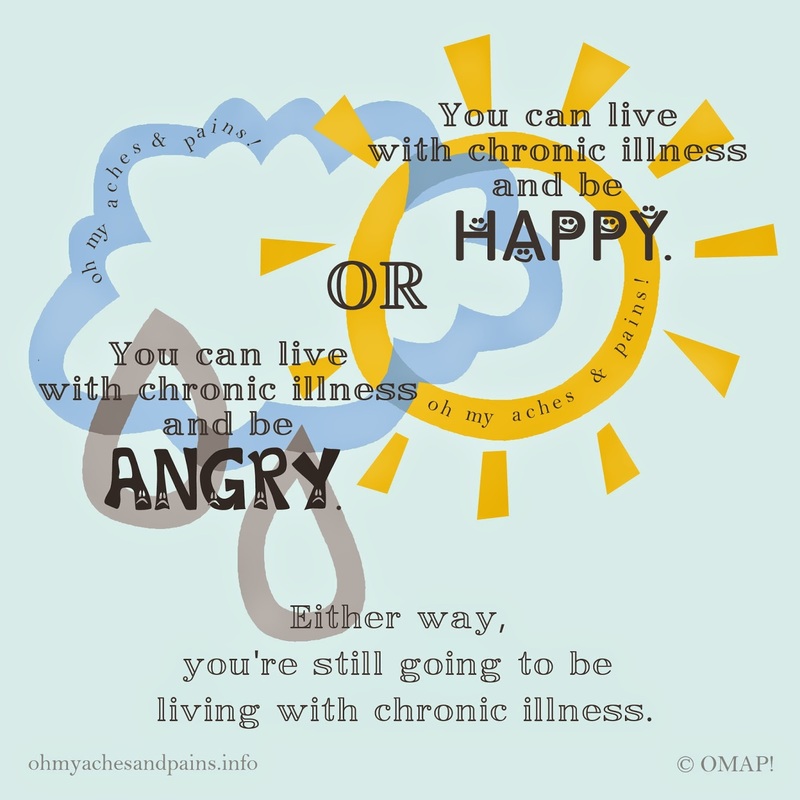 Either way, you're still going to be living with chronic illness. I have been struggling lately with more symptoms than usual. First I got some nasty stomach virus on Mother's Day that landed me in the ER with uncontrollable vomiting and the need for IV fluids and anti-nausea medications. Then, a week later, a very nasty pain flare-up began. I've been living with a higher than normal pain level and numbness and tingling in my right hand for the last 5+ weeks. Yesterday I went for an EMG and nerve conduction study. Hopefully it will shed some light on whether I have a pinched nerve and where exactly it is being pinched: my elbow, my shoulder or my neck. Between all the pain and other symptoms, the medications I have been taking to manage my pain and fatigue from being in more pain, I haven't been posting here or on the Oh My Aches and Pains! Facebook page. But I have been thinking about how much I miss regular blogging and what a struggle it has been to get back into a regular posting groove. But I will do it. I will get there....eventually. For today, I offer this graphic I created which illustrates my philosophy for living my life with chronic illness. This is my secret, my tool for making a real life possible despite chronic illness. I've been trying to explain this concept to a healthy friend of mine and they're having trouble understanding this. "You're sick," they say, "so how can you be happy about that?" "Well, I'm not happy about it, but I don't let it get in the way of being happy about being alive and being happy about the good things in my life." "But you're sick," they continue. "Do you really have good things in your life? Your chronic illness seems to have taken a lot of those good things away...."
"Yes, but I am finding new things to be happy about even though I am sick," I reply. They scratch their head and look puzzled. To them, being sick means being unhappy, so they just don't get where I am coming from. Lucky them for not having to have to understand this! Perhaps you my readers can leave me a few notes in the comment section below with some alternative ways of explain to someone healthy how it is possible to be sick and happy at the same time.